At the end of service on Saturday 24th October Midland Metro ran into the original Snow Hill terminus for the last time with the track from St Paul’s leading into the dark and cramped terminus closed to allow for the new city centre extension to be connected to the existing line. This brought to an end over 16 years of use and becomes the first stop on Midland Metro to be permanently closed. In the build up to the last day Midland Metro had already started to prepare for its closure with the glass being removed from the shelters and surveyors were also seen in attendance. 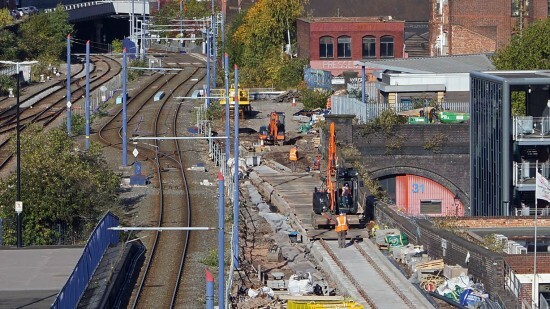 Once the line closes it is expected that preparations will commence for Snow Hill mainline station take over the trackbed allowing for a four platform station to help with an increase in capacity. 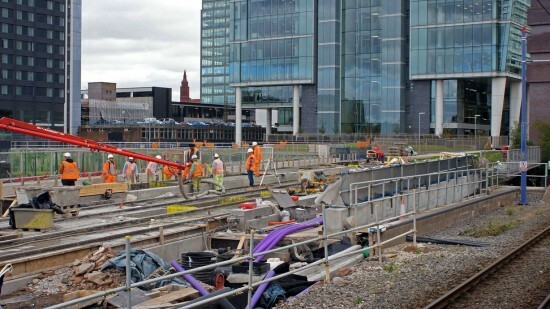 Construction work has been stepped up on the city centre extension particularly on the viaduct which will take Midland Metro away from its current alignment. Services from Wolverhampton St George’s are now terminating at St Paul’s and this arrangement is expected to remain for six weeks. During this period the two lines will be connected, all overhead will be installed and testing and commissioning will also take place. When services resume beyond St Paul’s the trams will run through to Bull Street but the new Snow Hill stop is not expected to be completed at this time. The final section of the city centre extension should then open by the end of the year. 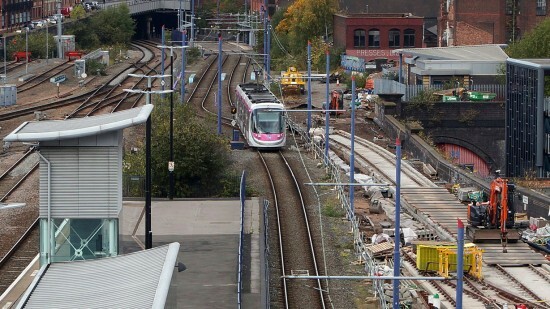 A view of the old and new lines at Snow Hill. 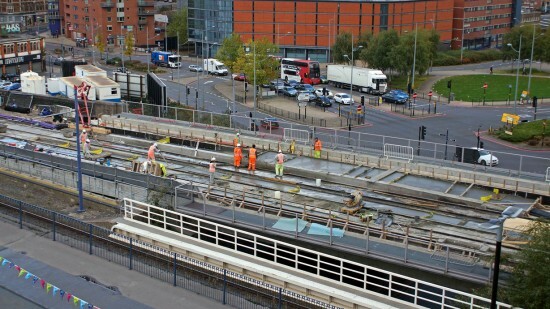 Work underway on the new line at Snow Hill. 26 approaches Snow Hill and passes the location of the new junction. 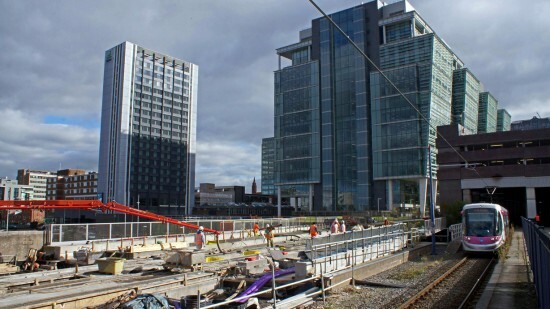 Another look at the construction work alongside Snow Hill station. this is very strange how can midland metro run to bull st, through what will still be a building site with regards to the new snow hill stop. Bull Street will be served in some six weeks time, by when Snow Hill will have completed clear running lines but not usable platform facilities. We were there yesterday to take a journey from current Snow Hill to Wolverhampton for the last time. Pictures will be sent to Gareth but he has lots of things to do, so no pressure on me to get them to him. Network Rail want their station back as soon as possible so that it will give them 4 platforms instead of the current 3 – allowing 2 in each direction. We photographed the sights at Snow hill which will disappear like the metro station, signage and the plaque from the official opening from 1991. Of course when the new Snow Hill was first opened it did have four platforms. Only when the trams arrived was one railway platform lost. Rail will undoubtedly be glad to get it back, a 25% increase in space. Us rail passengers who go through Snow Hill will be glad to get Platform 4 back too. Trains I am on are regularly held outside Snow Hill or at Moor Street due to no platform being available at Snow Hill. I can’t understand why they plan to run Bull St. Work seems far more advanced between there and New Street – there is what may be a terminal post at Bull Street/Corporation Street, but several headspan wires in place in Corporation Street and Stephenson Street and traction poles in Stephenson Place. Wires have been removed from the closed section. To one who is old enough to remember the last days of the old trams in Birmingham – which were 3ft 6in gauge – the fact that the present extension runs through the middle of the city along Bull Street and Corporation Street is of great interest since the original trams all terminated at various points around the city centre meaning that there could no through running from any of the routes to north, south, east or west. I can’t wait to ride on the city centre extension. If only they were double deck cars! This seems to have changed since Tuesday when the girl turning people away from the closed entrance to the tram platform at Snow Hill was telling someone they needed a train ticket.